I was looking forward to getting back on the river but with it being painfully low and clear, a good draw would be essential. 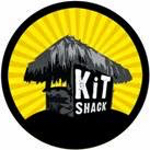 Rob and Fieldy had gone down yesterday to do some swim clearing and made sure there were enough pegs for today so a massive thanks for that, it really is appreciated. 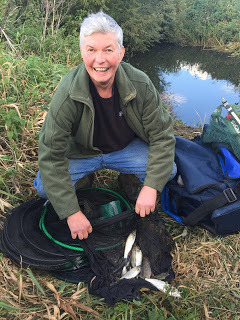 There was a decent turn out of eleven at the pub and Rob had put in five pegs at Coxes with six at Isle Brewers and looking at the swims I fancied 14 or 15 at the top end or 126, 128 or 129 down the bottom. 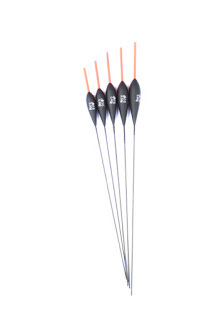 If I could’ve chosen a peg I would go for 14 (the tank traps) as it’s probably one of the best, most consistent pegs on the river and it’s one that’s been kind to me over the years. Rob announced the draw and as people started sticking their hands in the bucket of dreams (and nightmares) I could hear various pegs being mentioned, Fieldy was on 126, Rob drew 128, Gordon pulled out 15 but I still hadn’t heard anybody admit to 14, in fact when I stuck my hand in the bucket, there was only one ball left and when I pulled it out, the numbers 1 and 4 were staring back at me – result! So I’d drawn the peg I’d wanted but I certainly wouldn’t be counting my chickens yet as the Isle can be a fickle beast, especially when it’s low and clear and today it was also bright and sunny which wouldn’t do us any favours. 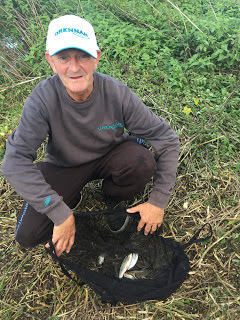 I got to Upper Coxes and showed Karl where peg 19 was and I have to say it looked nice, Steve P and Adie were in 18 and 17 respectively and both were very shallow and you could see the bottom all the way through them. On my way to the tank traps I passed Gordon on the far bank in peg 15 and his swim looked good too, then I got to my peg and if anything it looked better than the last time I fished it. Although you could see the bottom across much of the peg there were some darker areas by the tank traps and also to my left just off the main flow coming down from the weir. I set up two rigs, a 0.5 gram Dave Harrell DH16 and a 1 gram bodied float, both had size 18 Kamasan B611 hooks to 0.12mm. 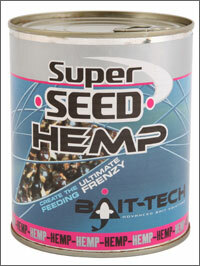 For bait I had casters, red and bronze maggots and some Bait-Tech Super Seed Hemp. 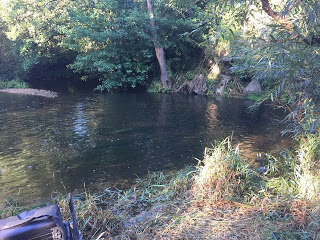 At the start time of 10:15 I feed some casters in the flow to my right and also upstream just off the main flow before starting a section short of the traps which would give me somewhere to go if bites tailed off or were hard to come by. 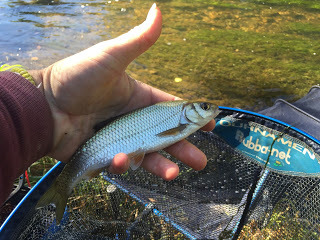 I didn’t have to wait long for my first bite and I was soon swinging in a 2oz chublet, three more followed before I caught a chunky gudgeon and it was a bite a chuck. 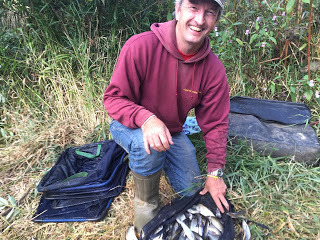 After an hour I had 18 fish, mostly small chublets along with a couple of gudgeon and some nice dace although I did bump several fish too but with 2-3lb in the net, I would be happy if I could carry on catching at the same rate. Bites started to slow up towards the end of the second hour but I still added another 15 fish, Hurf turned up to see how I was doing and while he was sat with me I had a couple more fish but decided to try up towards the weir where I’d been feeding from the start. 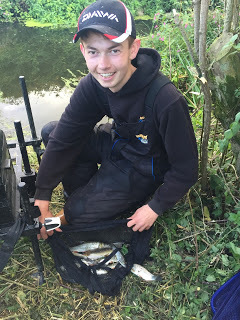 The float sailed away and a tiny chublet wasn’t the result I’d hoped for, I had another five or six fish around an ounce apiece and although I wasn’t bagging I was still putting fish in the net and crucially I was resting the other swim. After about half an hour I went back down towards the traps and although I was having the wait longer for the bites, I was catching a better stamp, including an 8oz chublet and with that, Hurf left me to it. At the half way point I was up to 50 fish but bites were tailing off again so I went back up towards the weir where I had another quick flurry of micro chub and I was just thinking I couldn’t see me fishing there too long unless some better fish showed when the next bite resulted in a nice roach of 4oz or so and then I had a clonking dace and all of a sudden things were looking up. 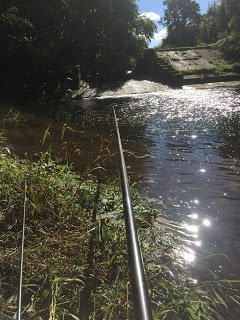 I carried on catching lots of small fish but the better fish started coming more regularly and the more hemp and caster I fed, the better the swim was getting. By the end of the fourth hour I’d put another 25 fish in the net and felt a good weight was on the cards. 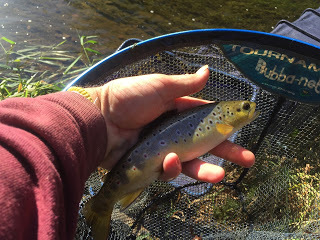 A little trout (which count in our matches) was a welcome bonus too! I was really enjoying myself but then a couple walked past with two Labradors and when they walked round to the concrete slope (to the right of the weir in the photo above), I just knew what was coming next. Sure enough a tennis ball was produced and soon the dogs were cavorting in the river much to the owners delight! Despite much head shaking from me, the canines continued to fetch the ball and how the women laughed every time they climbed out of the river and gave themselves a shake, showering her in water, they were having a lovely time. I, on the other hand, wasn’t. 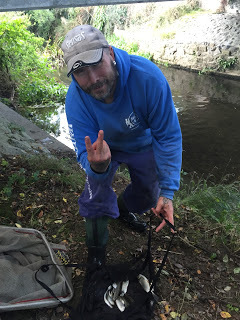 With all the commotion, the river went a horrible dirty colour with loads of dislodged weed coming down and from bagging up I went to catching very little and only added a couple of tiny fish while all the doggie mayhem was taking place. It felt like my match was slipping away but thankfully they didn’t stay too long, it was probably only about 10-15 minutes but it felt like hours! 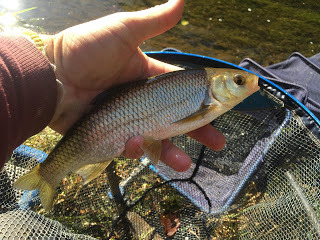 I went back to fishing by the tank traps and added a few more fish and then after the water cleared a bit I went back up towards the weir and started catching well again, including another roach and some more dace. Despite all that racket, I still added another 20 fish and the clicker was reading 95 with an hour to go. Another quick foray by the tank traps saw a few more fish added to my tally before I spent the last 45 minutes fishing off the main flow again and sport got stronger as we neared the finish line and I landed another cracking dace on the last cast to end with 114 fish (mainly chublets and dace plus a couple of roach, three or four gudgeon and that trout), I only had one minnow all day which just goes to show there were a lot of silvers there. I thought I probably had somewhere between 12-14lb which I hoped would be up round there but Isle Brewers normally chucks up some good weights so I’d have to wait and see. I packed up and went to give Adie a hand to weigh in and get some catch shots. As I was walking back to the car, I met Karl who gave me a hand with my kit (cheers mate) and as we reached the bridge, Adie was there and he said he’d struggled. 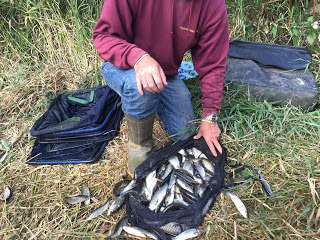 We walked down to weigh Karl in and he’d had some nice chublets and dace to weigh 2lb 7oz, next up was Steve P who’d really struggled for 9oz and lost a load of hooklengths and to be honest, 18 isn’t my favourite peg. Adie had a level pound and then Gord weighed 1lb 6oz so the rest of the section hadn’t fished great. I think Adie was telling me he’d missed two bites! I was last to weigh and Adie called my weight at 12lb 8oz and I’d had a lovely days fishing (apart from the impromptu Crufts display of course!) although I’d bumped/lost around a dozen fish so could have had nearer to 15lb today. I did ask Steve to take a catch shot, which he did, sort of (see below), I don’t think David Bailey has anything to worry about! 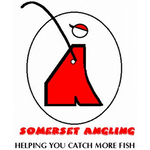 We loaded the cars and then waited for the anglers at Isle Brewers to get back, as they started to arrive Fieldy and Rich jointly had the top weight down there with 6lb 2oz so I’d done it, my first win on the river for ages. 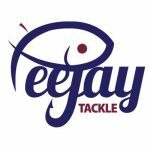 John Dursley had 4lb 3oz from peg 127 to win the section, Tony Newman had 3lb from peg 123, Rob had 2lb 7oz from 128 and Stuart Aplin had 2lb 2oz from 129 so it had been hard going for most today and some rain is desperately needed before next Sunday. So a lovely day’s fishing and I got my Royal Oak campaign off to a great start, also last weekend was the anniversary of losing my Mum so I hope she was smiling down on me today. Nice one mate. We get dog probs on the Kenn but I think they trouble the anglers more than the fish. Thanks Ivan, you're probably right, it's the same with ducks and swans etc, the fish are used to them but they cause us anglers loads of stress! Nice one Jamie. Lovely bag of fish. I know what you mean about our four-legged friends……….. I like dogs. It's the owners that are the problem! Cheers mate, yes I'm with you on that one!